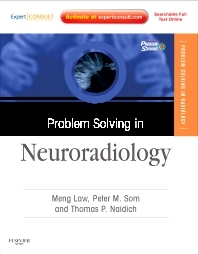 Problem Solving in Neuroradiology, by Meng Law, MD, Peter M. Som, MD and Thomas P. Naidich, MD, is your survival guide to solving diagnostic challenges that are particularly problematic in neuroimaging. With a concise, practical, and instructional approach, it helps you apply basic principles of problem solving to imaging of the head and interventional neck, brain, and spine. Inside, you'll find expert guidance on how to accurately read what you see, and how to perform critical techniques including biopsy, percutaneous drainage, and tumor ablation. User-friendly features, such as tables and boxes, tips, pitfalls, and rules of thumb, place today's best practices at your fingertips, including protocols for optimizing the most state-of-the-art imaging modalities. A full-color design, including more than 700 high-quality images, highlights critical elements to enhance your understanding. Apply expert tricks of the trade and protocols for optimizing the most state-of-the-art imaging modalities and their clinical applications used for the brain and spine—with general indications for use and special situations. Make the most efficient use of modern imaging modalities including multidetector CT, PET, advanced MR imaging/MR spectroscopy (MRS), diffusion-weighted imaging (DWI), diffusion tensor imaging (DTI), and perfusion weighted imaging (PWI). Successfully perform difficult interventional techniques such as biopsies of the spine and interventional angiography—key techniques for more accurately diagnosing cerebral vascular disease, aneurysm, and blood vessel malformations—as well as percutaneous drainage and tumor ablation. Know what to expect. A dedicated section is organized by the clinical scenarios most likely to be encountered in daily practice, such as neurodegenerative disease, vascular disease, and cancer. Avoid common problems that can lead to an incorrect diagnosis. Tables and boxes with tips, pitfalls, and other teaching points show you what to look for, while problem-solving advice helps you accurately identify what you see—especially those images that could suggest several possible diagnoses. See conditions as they appear in practice thanks to an abundance of case examples and specially designed full-color, high-quality images which complement the text and highlight important elements. Quickly find the information you need thanks to a well-organized, user-friendly format with templated headings, detailed illustrations, and at-a-glance tables.